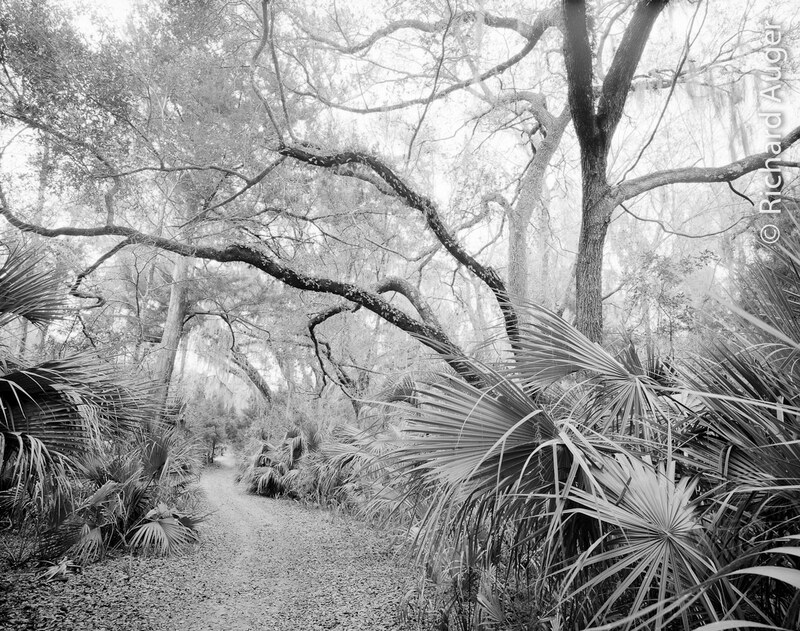 After a long string of art festivals in late February 2012, I decided to take a break and scout several areas in the Ocala National Forest, carrying a water bottle, my Mamiy 7ii, and a couple rolls of film. One of my stops was at Silver Glen, located in Marion County, which has one of my favorite springs to stop for a relaxing swim. Juniper Springs has always been my favorite place in Ocala to photograph and kayak, with its majestic river run, historical sites, and twisting boardwalks. Alexander has a less interactive feel, but is perhaps easier to sit in the sun and relax. This time, though, I was here to walk the trails and see the rest of the park. Walking through the riverine swamp and pine flatwoods was a short, splendid journey. After entering the area along Lake George, I realized at how low the water level had become. Low water levels, however, make it easy to walk into the lake itself, and capture interesting subjects. So I kicked off my shoes and carefully walked through the squishy lake bottom. 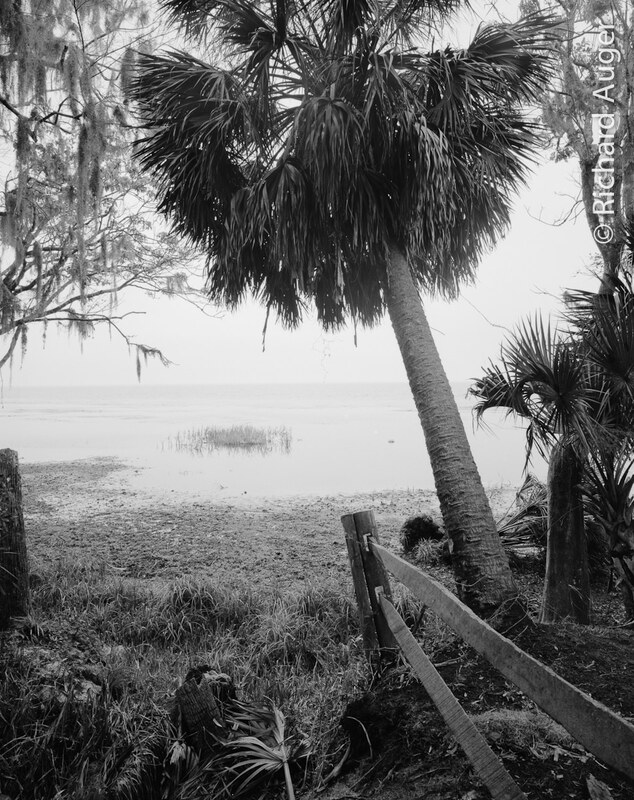 I photographed this lonely palm tree while walking along the lake shore. Most of my work focuses on texture on detail, whereas this image involves form and simplicity. Some photographs are meant to be printed, and this is one of them. The soft whites have long subtle tones that can only be seen in an enlargement. Sometimes during a scouting trip, I manage to create an image for exhibition, which always feels great. If the light is good, the light is good. The bright, hazy sky created an interesting use of negative space. Lake George, Ocala National Forest. TMAX 100, TMAX Dev. Mamiya 7ii, 47mm f/4.5. Photo By Richard Auger. Cypress Knees. Lake George, Ocala National Forest. Mamiya 7ii, 43mm f/4.5, TMAX 100. Photo by Richard Auger. My hike back was pleasant, with cool spring air and a gentle backlighting breaking between the trees. While my focus has been on shooting water since last December (2011), my original love of landscape photography began with shooting the woodlands and swamps of South Florida. 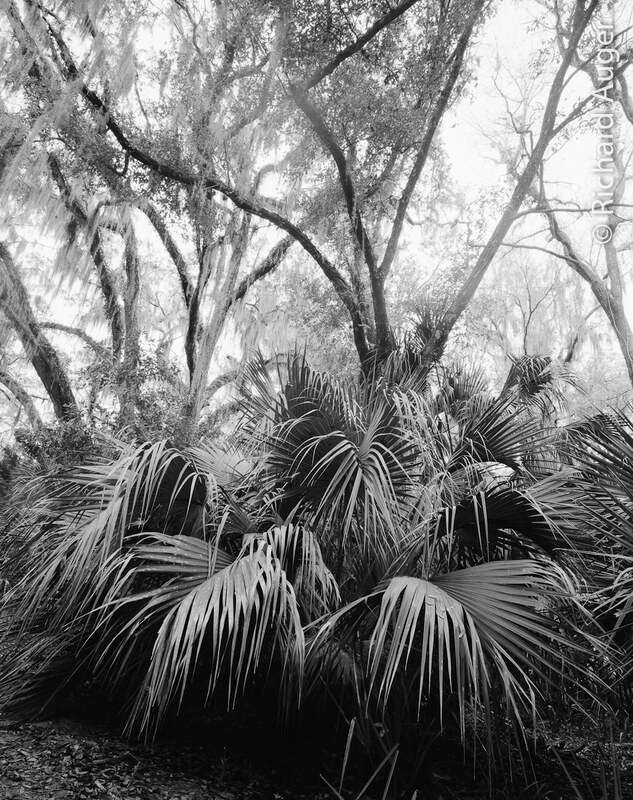 The Florida wilderness provides unlimited compositions of lines and texture, also with a trail or field to give the viewer a sense of walking into scene. Later in April and May, I’ll be returning back to shoot the springs at sunset with slide film, as well as kayaking Lake George to get more black and white photographs. For now, enjoy the remaining photos below. Lake George Trail, Ocala National Forest. Mamiya 7ii, 43mm f/4.5, TMAX 100. Photo by Richard Auger. Check out my latest blog post at the Ocala National Forest! 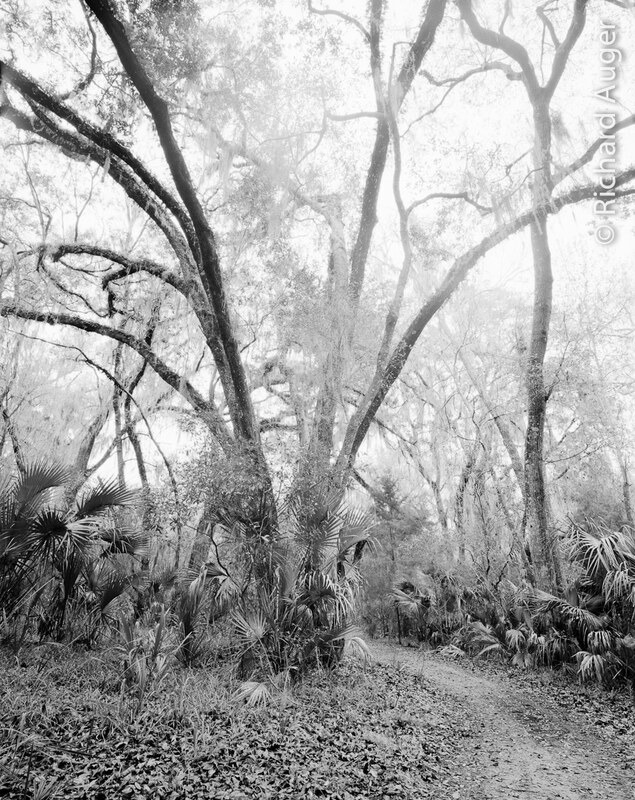 Check out my latest blog post about the Ocala National Forest! 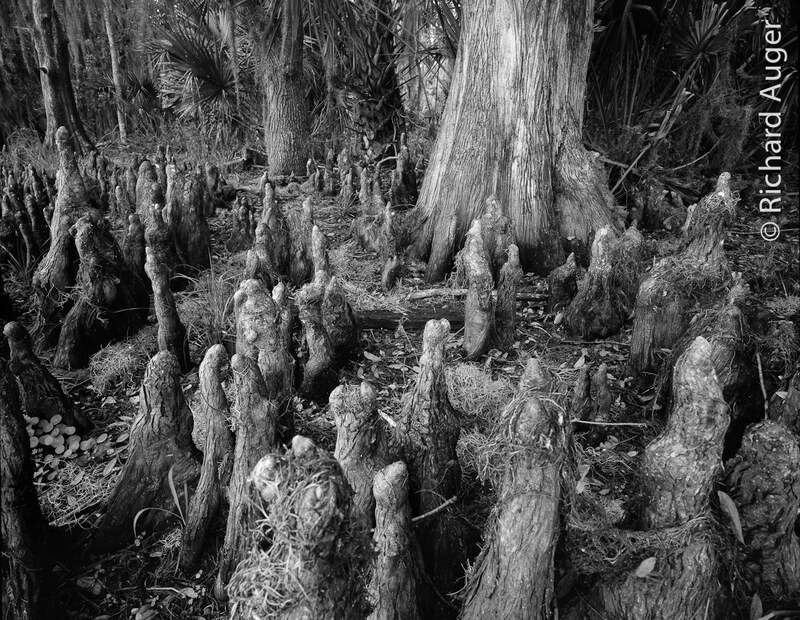 these are beautiful, I think my favorite of these shots are the single palm tree one, the cypress knees, and this very last one! by any chance, have you ever gone to Rainbow Springs? I've only been there once, the scenery is lovely there, I bet you can work wonders with their landscaping! Thanks Kareen! Yup, I've gone to Rainbow Springs, one of my favorite places to take a walk (most photos in color). 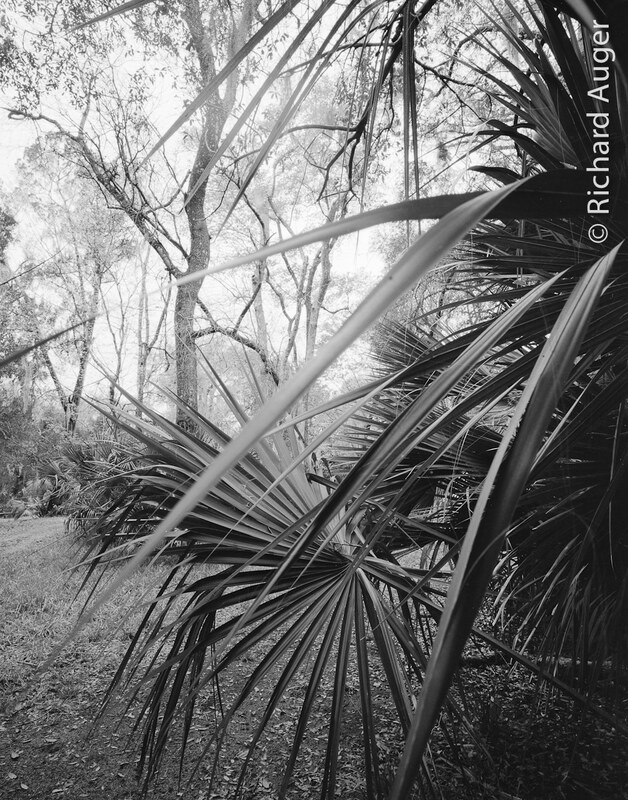 A couple photos in my b&w portfolio are from the park; next time I redo my flash slideshows, I'm planning on adding locations. Also, if you search Rainbow Springs at the top of my website, it will bring up the pages with those shots. Hi Richard, I just happened upon your site via my Sea Eagle blog. Absolutely stunning photos of your journeys. We live in Sun City Arizona now and own a Fast track 38. Our son lives in Orlando and we are comming out to Florida in Dec. We will bring our FT with us and would appreciate a recommendation or 3 to paddle and really see Florida as you have. We plan to drive so we have access to all of Florida let’s say Orlando and south. Any suggestions would be most helpful. Hi Mark, thanks for commenting! Don’t leave Florida without paddling the Juniper Run and The Loxahatchee River. They are both the most different from what you’re used to seeing, and are my favorite rivers; the Juniper has crystal clear, cool, spring fed water, with a Tarzan like tropical look. The Loxahachee has beautiful old cypress and fauna. Both rivers are well canopied with twists and turns. (FYI Juniper only allows hard shells, but they rent them cheap and include pickup). Just north of Tampa, you have the Hillsborough River, which is epic, and maybe the most scenic in Florida. Ocean kayaking is also great, especially in December. Bahia Honda is a good place to start, as well as the mangrove swamps. Kayaking in the Pine Island area on the Southwest Coast is great, especially Caya Costa, which is an island Florida State Park that can only be accessed by boat. Book camp sites early in the ocean areas 6 months in advance.